Serving Our Vets - Here is the Real Spirit of America! Here is the Real Spirit of America! Here is an inspiring note from one of our favorite service organization's Spirit of America. Spirit of America is a non-profit organization: a 501c3 public charity whose mission is to help Americans serving abroad assist people in need. Founded in 2003, it has provided millions in targeted assistance to help US troops to help local people in the Middle East, Central Asia and Africa: Afghanistan, Kyrgyzstan, Iraq, Pakistan, Djibouti and Kenya through a groundbreaking model for partnership of a nonprofit organization with the US military. Our support is fast, flexible and decentralized. It improves conditions and relationships on the front lines. It makes our troops safer and more successful in their mission. And, it helps people in remote areas that official aid programs don't often reach. It is with deep appreciation that we announce the end of Chrissy Burbach’s tour as a Field Representative with Spirit of America. Chrissy, an Army veteran, joined Spirit of America in March of 2012. Chrissy originally signed on for an eight-month tour in Afghanistan but, because of the needs of US troops on the ground and the great impact of her support, she extended to 11 months. She will spend the summer traveling and begin graduate school in Ireland in the fall. Chrissy is going for a Master’s degree in International Relations. After grad school, she plans to return to the nonprofit sector and continue her service to the greater good. Chrissy finished her service in the US military as an Army Civil Affairs Captain. She deployed twice to Iraq, once in 2007 and again in 2011. Here she is during her last tour in Iraq. From her two deployments to Iraq she says, “I realized that the conflict could not be resolved through kinetic means alone. I understood that progress was achieved by enabling self-reliance of the local populace and by legitimizing the security forces and government.” Chrissy took those lessons and applied them at Spirit of America in support of our troops and their missions in Afghanistan. During the eleven months she spent in Afghanistan, Chrissy completed forty-one Spirit of America projects in collaboration with Special Operations Forces, conventional units, and US government civilians. Working in dangerous parts of the country in the south and southeast. Chrissy’s dedication and courage made US troops safer and more successful and improved the lives and future of the Afghan people. 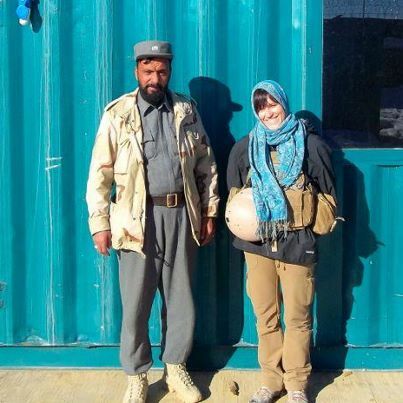 Many of Chrissy’s projects focused on improving the well-being and prospects of women in southern Afghanistan. Chrissy helped improve security by providing critical equipment, like the motorbike below, to the Afghan Security Forces. We wish Chrissy all the best in her new endeavors and express our most sincere thanks for the great work she did here at Spirit of America. Her dedication, can-do spirit, and humor will be missed!